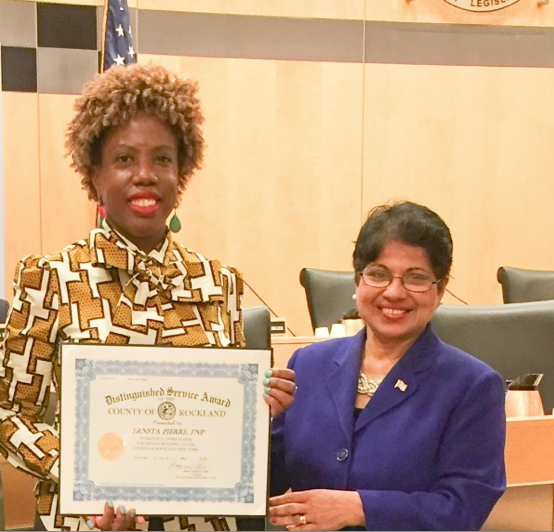 Two local women are being recognized by Rockland County Legislator Aney Paul for the positive contributions they have made through their nursing and volunteer service. 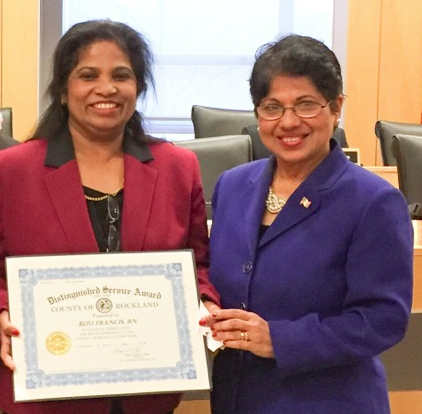 Paul, who holds a doctorate in Nursing Practice and has been a nurse for more than 30 years, presented Distinguished Service Awards to Ernsta Pierre of Spring Valley and Biju Francis of Nanuet. May is traditionally the month when nurses are recognized worldwide, in part because May 12 is the birthday of Florence Nightingale, perhaps the most famous nurse of all. She professionalized nursing roles for women and is known as the founder of modern nursing. Ernsta Pierre launched her nursing career after attending BOCES and becoming a licensed practical nurse in 1993. She didn’t stop there – earning an associate’s degree in nursing from Rockland Community College, pursuing a bachelor’s degree at SUNY New Paltz and completing a master’s degree nurse practitioner program at Dominican College. Pierre currently works as a nurse at Good Samaritan Hospital. She is also a member of the Haitian American Nurses Association of Rockland, which conducts health awareness workshops and medical missions. Pierre says that one of her greatest satisfactions as a nurse occurred when she provided medical care to earthquake victims in Haiti in 2010. Biju Francis is a native of India who has worked as a nurse in the United States for more than 30 years. She earned her bachelor’s degree in nursing from Grand Canyon University in Arizona and is a registered nurse. She and her husband, Clement Francis, launched a home health care business, Sunshine Home Care, in New City some 20 years ago and have since expanded their business to provide services in surrounding counties in New York and New Jersey, the Bronx and Chicago. Francis, who serves as Director of Clinical Operations, said the motivation behind the company was to provide the services people need to be able to stay in their homes. She and her husband have four children, Alex, Ashley, Brandon and Samantha. Francis is active with St. Boniface Church in Wesley Hills, where she serves on the Parish Council and the Women’s Forum. She has also served as a substitute CCD religious education teacher. She previously volunteered with Meals on Wheels of Rockland. “From the beginning, my passion was to make a difference in our community by utilizing my healthcare background and skill set,” Francis said. She added that “a passion for compassion” has always motivated her work.